Using rope to create sculptural installations, Museum of Arts and Design artist-in-residence, #JesseHarrod manipulates and transforms materials to animate their sexual and sensual qualities and explore the intersections between queer kinship, support, and sexuality. In her sculptural installations, she works with rope as a pliable element that she regards much like a drawing tool, specifically utilizing knot-making techniques such as macrame in ways that can be understood as simultaneously restraining and supporting. Visit Jesse Harrod every Friday at @MADMuseum’s Artist Studios. New York Textile Month is pleased to announce an invitation to Jeannine Han’s Open Studio on September 23rd from 1pm - 4pm. She has participated in our annual open studios in the past and this year she will discuss her current work in hand weaving processes. There will be light refreshments served, all are welcome! 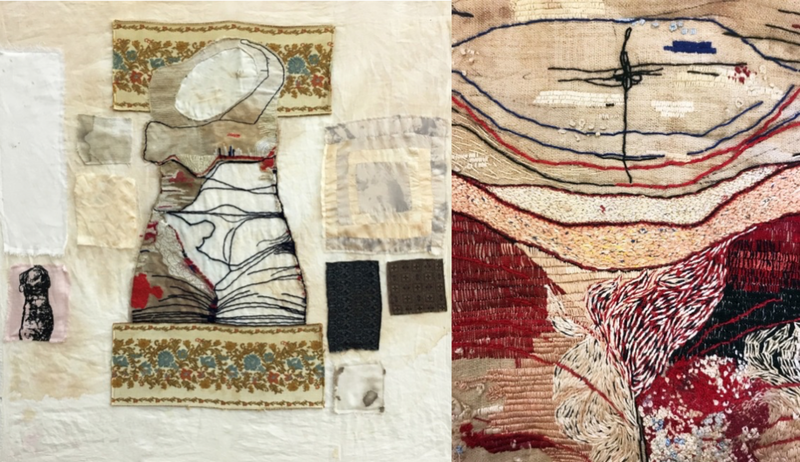 Kiva Motnyk, founder of Thompson Street Studio, invites you to her Soho studio for a tour and short experimental quilting workshop. We will learn the hands on process of creating a small quilted textile using repurposed, or naturally dyed materials in free form way. Materials will be provided however Students are invited to bring meaningful textiles they would like to incorporate into the piece. Thompson Street Studio designs objects for the home with a focus on experimental textiles. We explore connections between art, industry and nature through a process of conception, collaboration and innovation. Our goal is to inspire community, building on traditional techniques to create heirlooms with modernist sensibility. Kathleen McDermott is a media artist with a background in installation and sculpture. She uses a combination of textiles, sculptural materials and open-source electronics to craft absurd wearable technology pieces that aim to explore the relationship between human bodies and technology, in both real and imagined scenarios. In addition to her artistic practice, she is an advocate for accessible technology education, sharing tutorials for working with DIY electronics on urbanarmor.org. During her time at the WIP Residency, McDermott will be completing a large skirt covered in speakers, titled Urban Armor #8: The Public Speaker. Production research for this project has included the creation of numerous custom speaker experiments using materials such as conductive thread and magnets. The current iteration of the project uses low-cost, pre-fabricated speakers, individually soldered to mini-amplifiers, and sewn into the garment. The Public Speaker will ultimately be linked to a microphone, and will playback sounds it picks up as the wearer moves through the city, as a kind of mockingbird/surveillance machine. The Public Speaker is part of Urban Armor, a larger series of experimental wearable electronics which respond to environmental and urban data in unique and ridiculous ways, in an effort to bridge the gap between speculative, virtual and physical spaces. Kathleen holds a BFA in Sculpture from Cornell University, an MFA in Creative Media from City University of Hong Kong, and is pursuing a Ph.D. in Electronic Arts at Rensselaer Polytechnic Institute (RPI). She is currently a Visiting Industry Assistant Professor of Integrated Digital Media (IDM) at NYU. Founded in 2017, Pouch is a New York-based furniture design studio in the business of reconceptualizing comfort. In collaboration with artisans in Chalate, El Salvador, the Pouch design collective consists of New York-based artisans and designers contributing their craft and creative perspectives to a common platform. The resulting product integrates timeless handwoven techniques from Central America with endless customization options for an elevated style of hammocks that challenges existing modern environments. Pouch extends the versatility of hammocks and hanging chairs, aiming to make the physical experience of leisure readily available within the parameters of contemporary living. Barrie grew up in New York City but always felt a deep connection to nature. In her early twenties, she began working on organic vegetable farms, first in New Zealand, and then across the U.S., from California to New York. Through years of farming and study, Barrie became increasingly well-versed in plants and their medicinal properties, eventually falling in love with the traditional practice of plant dyeing. Meet Lori Weitzner and view her inspirational Chelsea based "white box sanctuary", where you can learn about the creative process behind the eponymous Weitzner brand of textiles and wallcoverings. In addition, get a first look at Lori's latest venture-a jewelry collection launching in November. Unique beaded and embroidered pieces rooted in age-old artisan techniques- made for the modern woman. Tick Studio operates out of a townhouse in the East Village, where Suzanne works and lives. The building was the site of the Reuben Gallery in the late fifties and early sixties, where Anita Reuben invented art Happenings and where artists such as Jim Dine, Allan Kaprow, Robert Whitman, Claes Oldenburg, Red Grooms, and many more exhibited their work. This rich tradition of creativity and exploration carries on into the present day, where the newly renovated Tick Studio develops a range of products including glass, floorcovering, upholstery, drapery, and wallcovering. Suzanne also maintains a fine art hand weaving practice and creates woven sculptures from repurposed materials that are collected and exhibited worldwide. AllStar yarns with botanical dyes. details for Sept 15th weekend. Celebrate the magic of making textiles by hand and join us at WE GATHER’s Weaving Circle. Bring your own loom or come as you are and use one of ours. All skill levels are welcome, from complete beginner to total master. 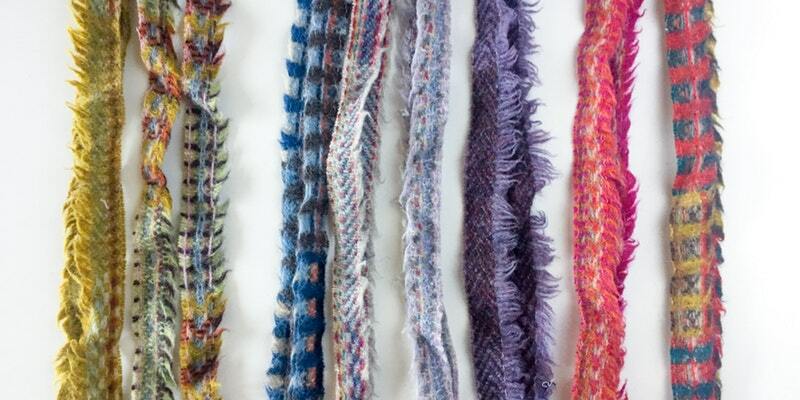 WE GATHER owner and textile artist Whitney Crutchfield will offer short tutorials on basic weaving skills, and we’ll have some of our favorite studio yarns on hand for textile experimentation. Stay all afternoon or just for a few minutes, and enjoy the company of others and the satisfaction of creating cloth. WE GATHER is a Brooklyn-based educational textile studio and brand of hand-dyed, handwoven textiles. Whether through thoughtfully and ethically-made products made right in the Brooklyn studio, at-home weaving and dyeing kits, or workshops and private events that put the skills directly in your hands, our goal is to bring the magic of textiles to all. This event is free and open to the public, though limited spaces are available. Kindly RSVP to reserve a spot. As part of the second annual New York Textile Month, Weaving Hand and Designtex will propose a community oriented weaving event which will shed light on waste produced by the textile industry. The two part event will take place at the Designtex headquarters in SoHo giving visitors a look into how textiles are made through participatory weaving events. Part two of the evert will focus on making products out of the textiles woven during the Weaving Gathering. For this part of the event we will partner with Black Girls Sew, a non for profit which focuses on providing a positive influence on the lives of young girls through sewing, design, and entrepreneurship. During the Sewing Gathering, participants will have the opportunity to sew a tote bag, a pillow, or a coin purse from the zero waste textiles produced earlier in the month. Volunteers from Black Girls Sew will be there along with Weaving Hand and Designtex to provide sewing instructions for everyone. We have called these events the Weaving and Sewing Gathering because traditionally weaving and sewing were done in a community environment. The physical craft provided a place for exchanging ideas, techniques, cultures, crafts, communities, and more. We feel that by emulating this type of community we can better help people understand the complexities of the textile industry and as well of the power of collaborative work environments. We look forward to engaging with different communities through the simple joys of hand making. Join multi disciplinary outfit Martyn Thompson Studio for an open studio and afternoon tea at their SoHo loft and showroom. An opportunity to explore and discuss the studio’s collection of US-woven jacquard designs, all borne from Martyn’s photography, as well as the studio’s range of collaborative projects. Photographer, Martyn Thompson, began his career making clothes before deciding to document them instead. He worked as a fashion photographer in Paris prior to moving to London where his scope broadened into the world of interiors and still life. Over the past 30 years Thompson has collaborated with several designers - most notably a long relationship with Ilse Crawford. He has worked to create the visual messaging of leading global brands such as Hermés and Ralph Lauren while also authoring two books, “Interiors” and “Working Space: An insight into the Creative Heart”. A resident of New York now for many years, Thompson founded Martyn Thompson Studio, a multidisciplinary outfit that has branched out from Thompson’s distinctive photography practice into a number of creative expressions. An aesthetic, anchored in the touch of the hand, stems from Thompson’s love of craft, and runs through his studio’s work, defined by a tactile and painterly language that is a visual push me, pull me between nostalgia and now. The studio has evolved to include textile and wallpaper design, homewares, limited edition art, as well as art direction for editorial projects. In addition Martyn Thompson Studio works with a number of brands as a creative consultant giving direction on the areas that help shape and define a visual identity: color, mood and tactility. Artist, designer and educator Jeannine Han will be housing an open studio with works on view for New York Textile Month. Her work examines the intersection of materiality, technology and social practice via an interdisciplinary studio practice involving fashion, textiles, sculpture and film. Jeannine will present her multiform approach to her studio practice which also involves curating shows from the artist's studio. She will discuss how working with local communities of artist and designers provides a critical framework for making and thinking for cultural knowledge. The works on view are comprised of a collection of textiles as interior and wearable objects, to explore materiality and it’s ability to communicate multiple meanings. The Domestic Performance Agency (DPA) is a project/space incubating experimental dance practices and economies with the presence of food, cloth, and hospitality. For NYTM, founding artist of Domestic Performance Agency--Athena Kokoronis--will give a performative Introduction to DPA projects highlighting the collaborative textile designing with her daughter as well costume collaborations with other dance choreographers. Kokoronis will personally present these material works as well as the conceptual nature these materials support within the Domestic Performance Agency. Refreshments will be offered. WE GATHER, in collaboration with FAD Market, will offer an interactive Community Cloth experience from 1-4pm on Saturday, September 23 and Sunday, September 24 at City Point BKLYN STUDIOS, 445 Albee Square West, Brooklyn, NY 11201. Join us as we create a zero-waste Community Rug using traditional latch hook techniques and salvaged materials from the textile industry. Everyone is invited to do their part to create a beautiful and sumptuous new functional textile out of wool off-cuts from Wallace Sewell and industrial materials donated by Tenax. Participants will be given a short tutorial on basic latch hook technique and the opportunity to contribute to this large scale Community Rug. Proceeds from the Community Rug will be donated to organizations benefiting women and girls in New York City, causes that build love, community, and the value of human-to-human compassion. Community Cloth is a part of the WE GATHER business that is close to the heart. We invite anyone to join us, whether you’re sitting at one of our looms, dyeing in one of our vats, or adding to a latch hook piece. Community Cloth is created by the hands of countless strangers-turned-friends, each contributing their little bit of labor, curiosity, and energy to creating a larger whole. This event is made possible through the collaborative efforts of Designtex, Wallace Sewell, Tenax, and FAD Market. The Textile Arts Center is a NYC-based resource facility dedicated to raising awareness and understanding of textiles through creative educational programs for children and adults, residency programs and access to equipment. Come tour the Textile Arts Center Brooklyn studio during Textile Trek to see our classes in action; our new studio spaces and equipment, such as our new 10 yard yardage table, dye lab, looms, knitting machines, and more. FAD Market – a roving Fashion, Art and Design pop-up marketplace – celebrates New York Textile Month with a specially curated market of New York’s best up-and-coming textile and fabric makers. Happening at the newly-launched City Point in Downtown Brooklyn, visitors can look forward to a stunning selection of unique apparel, fashion accessories, home textiles and furnishings from the city’s top independent designers. 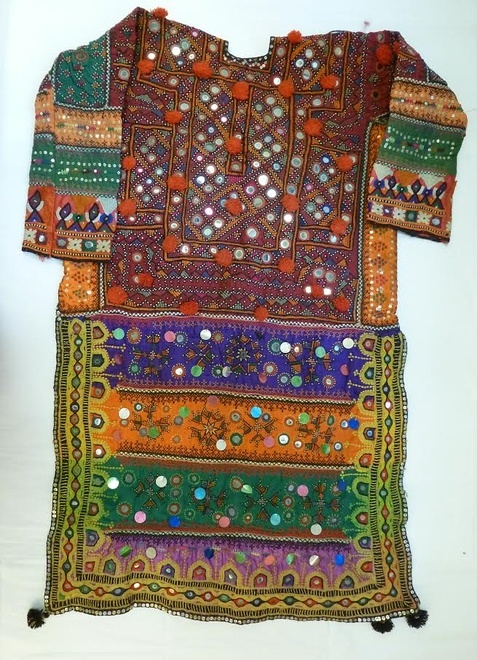 The prominent Textile Art Center presents an exciting series of demonstrations highlighting the intricate techniques behind various textile art forms such as loom weaving, screen printing and machine knitting. Non-profit textile recycling company FABSCRAP joins the market with a pop-up fabric shop and educational workshops. A capsule exhibition showcases a collection of two-dimensional and sculptural textile art, featuring prominent New York artists including interdisciplinary artist Evan Paul English. Join us at the Sunday Suppers studio for a wall hanging workshop lead by Emily Katz of Modern Macrame. In the class, Emily will demonstrate a handful of her favorite knotting techniques, and show you how to get started on your wall hanging. You will design and create your own macramé wall hanging with Emily’s expert guidance and support. We provide all the materials you need to complete your unique piece of art, and a light breakfast will be provided by Sunday Suppers. Emily Katz is a creative consultant, interior designer, macrame teacher and artist. Even though she has called Portland, Oregon home for most of her life, you can find her happiest collaborating on photo shoots in the desert, rearranging furniture in homes around the world, feasting under the stars, discovering hot springs, and singing songs with friends. She has taught macrame to thousands of people around the globe, from private lessons, to beautifully curated workshops, to team building for creative companies. Her aim is to not only share her love of this simple craft, but also inspire people to be better versions of themselves. To celebrate New York Textile Month, Sunbury Textile Mills is opening it’s mill doors and inviting participants to share in a day of jacquard weaving. Guests will be guided through each of the manufacturing processes at the Sunbury Mill- from yarn prep and warping, to the weaving shed itself. Included in the tour will be the Mill’s Archive, housing thousands of designs and construction samples from Sunbury’s rich textile history. Founded in 1954, Sunbury Textile Mill is one of the few remaining custom mills of its type, manufacturing 100% of its products within the United States. This is a rare opportunity to peer inside one of America’s remaining textile mills. Sunbury is looking forward to sharing this glimpse with you. Included in the ticket is transportation on a chartered bus to and from Sunbury, a light snack and beverage throughout the trip, and Lunch at the Mill upon arrival. Be quick as seats are limited! RESERVE below. We are pleased to announce the opening of KOFU showroom in Chelsea, NYC. For our inaugural exhibition, we will be showing our latest collaboration with Erin Wilson, a master quilter based in Brooklyn, NY, who makes intricate piecework rooted in architectural imagery. We provided Wilson with swatches of vintage and heritage fabric from Japan, most of which were leftovers from our production. Wilson magically pieced such “wasteful” small fabric swatches together, and “upcycled” them into irresistible works of art. The show also includes Wilson’s Shape Study series, made with her own hand-dyed fabrics. Along with Wilson’s works, we will also display the latest KOFU collection of one-of-a-kind home goods made from traditional Japanese fabric, including fully hand-embroidered “sashiko” pieces, vintage “boro”, and ikat fabrics. *Hours of operation may change. Please check our calendar for any schedule updates. If it were possible to create a habitable textile, what would it look like? Could this textile evolve to become nature? Like nature, the resiliency of textiles is a story of form. A mystery of geometric interplays, textiles are ever present yet not fully understood. Join Work In Progress resident Diedre Brown to explore these questions, while learning more about natural hyperbolic structures and crocheting wild textiles. Yarn and crochet hooks provided, but feel free to bring your own. Diedre integrates principles of the natural sciences, art, design, and research to comprehend the anatomy and physiology of all things. Holder of a Master of Architecture from Parsons The New School of Design, Diedre applies her knowledge to developing integrated and interwoven urban intervention design systems. Learn more about her work and her Work In Progress residency here. You can visit Diedre's installation for Work In Progress from September 1 - 30 and learn more about her work and process during Artist Open Hours, on Saturdays, 2-5PM and Tuesday - Thursday 11am-5pm, at our Manhattan studio.